As the introduction of stuffed crust pizza so unequivocally has proven, the best can always get better! That is something that is always on the design team’s mind at Klim. For years they have made some of the most premium adventure riding gear on the planet, and now, they have taken a great stride forward in offering the same impeccable quality for the street. 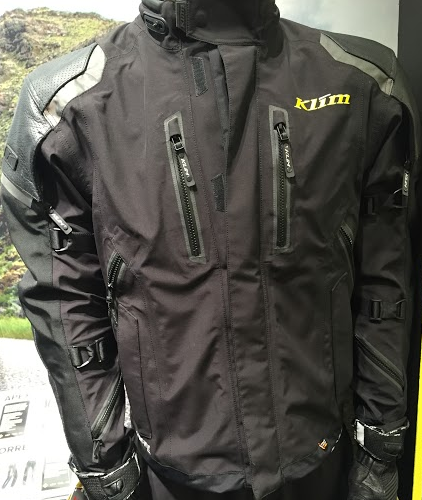 The new Klim Apex Jacket, has been slimmed down over the traditional Klim cut. In doing so, they have made this jacket more on-road functional and stylish while not diminishing the mobility factor. By utilizing the world’s preeminent waterproofing and providing the 100% waterproof guarantee that comes with the Gore-Tex name, you know that no corners were cut in the 3 layer laminate Pro Shell outer. The same can be said for the protection incorporated into the jacket as well. From the perforated leather panels in high impact areas to the full assortment of D30 armor which includes a CE-2 back protector, you know that you will be getting the very best in every regard. Taking new strides, and doing it the right way, is something that advances all of our experiences. Whether it is with regard to new and exciting culinary creations, or in the furthering of on-road motorcycling protection, comfort, and functionality, it is pretty darn cool.